I was having a hard time deciding which side of this forty-five to post. It’s one of those special records that has two A-sides; or two good tracks. I decided to share both, because they’re damn near perfect poetry. 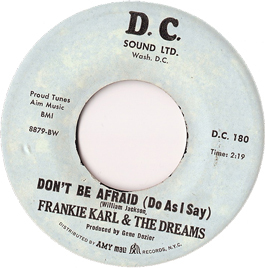 It’s no surprise that Frankie Karl’s roots were in gospel because some of the best soul singers had their start in church. And because there is only a small difference between professing your love to the lord and to your sweet heart, Karl was a natural at crafting perfect melodies to croon to the ladies. These two gems are swinging lullabies that Karl easily dances across; beautiful cause they’re simple and speak true. This is one of my favorite records. I hope it becomes your favorite too. Enjoy. This entry was posted on Wednesday, January 13th, 2010 at 9:37 pm	and is filed under Uncategorized. You can follow any responses to this entry through the RSS 2.0 feed. You can leave a response, or trackback from your own site.